Oh, the dreaded bloat. It can hit you at any time, and sometimes even the worst times – like when you have a super important meeting, you’re getting ready for a night out, or you’re having a romantic night in. Bloating can build up throughout the day or strike after a meal, and there are a bunch of different things that can cause it. But fear not, because if you want to know how to get rid of bloating, I’ve got some handy tips up my sleeves! Before we get into those tips, it’s essential to understand the nitty gritty details of what causes bloating in the first place. Because on top of getting rid of bloating after it has started, you might also want to know how to prevent it! Overeating is one of the main culprits of bloating. There have been so many times where I just keep eating even if I’m full. Anyone with me? Either the food is just so good or I keep nibbling at it because it’s right in front of me. Try to keep your portion sizes reasonable and put your plate away if you’re feeling full. You can also beat bloating by eating more slowly. This makes it less likely for you to overeat because your stomach has time to get full. Sodium is one of the other biggest causes of bloating. Your blood actually becomes thicker since sodium causes fluid build-up, which also means your heart has to work harder. So, when you’re bloated and uncomfortable, there’s a reason behind it. Stay below 20% sodium per serving- those nutrition labels are good for something after all! If you want to eliminate bloating in the long run, exercise is key. Without physical activity your system will likely clog up and you’ll become constipated, which contributes to the feeling (and look) of bloating. Working out 3 to 5 times a week will not only keep you in shape, but keep you healthier and decrease your chances of bloating. If bloating is something you struggle with, read on my friend! From foods to teas and exercises, here are 8 tips to get rid of bloating. When it comes to eating fruit, you don’t have to tell me twice – I love how fresh, juicy and delicious pretty much all fruit is. And when it comes to bloating, it’s best to eat fruit with the skin on it. The skin is packed with fibre, which reduces constipation and keeps things flowing through the digestive system. Berries, apples and peaches are some of my favourites! Probiotics- found in foods like yogurt, miso and kefir, help to keep your system regular and relieve bloating. Make sure to eat them on the regular if you don’t want puffy tummy syndrome. And if you’re already feeling the bloat, have some yogurt with berries for dessert. This way you get probiotics AND fruit with skin! Potassium helps relieve water retention in the body, flushing extra liquid out of your system. The result? A nice, flat stomach. Bananas, mangoes, spinach, avocados, beans and squash are all high in potassium and should be worked into your daily meals! When I worked in a tea store, I was often asked what tea to drink to help with bloating. My answer? Oolong! Oolong tea is amazing for cleansing your system and pushing out water weight – it’s one of the best slimming teas. It’s also served at many dim sum restaurants as it’s great for digestion. Just make sure to drink it after you’ve eaten as drinking tea on an empty stomach can actually contribute to bloating. Along with oolong, peppermint is another great tea that helps with stomach issues ranging from bloating to gas to tummy pains. It helps settle your stomach and is very beneficial for your digestive system overall. Peppermint tea has relaxant properties that ease digestive discomfort, so make it a post-meal must! There are tons of yoga poses that help with digestion and bloating. I even took a whole detox class devoted to stimulating the digestive system, and I felt great afterwards. Whenever I feel bloated I do some yoga stretches and it really does help! Even if you feel like slumping it out on the couch, one of the best things you can do when you’re bloated is keep things moving! Check out the tutorial below to see what you can do to decrease stomach bloating with yoga. Cardio helps reduce bloating as it pushes gas through the digestive system. If you don’t do physical activity you’re more likely to get all clogged up. If you’re feeling really bloated after a meal, take some time to digest and then go for a walk, do a light jog, or go cycling or swimming. These cardio exercises will help get everything in your digestive system moving properly. And don’t just wait until you’re bloated! Doing 30-minute cardio sessions 3 or 4 times a week will help your system so you’re less likely to ever feel bloated. Strengthening your core benefits you in so many ways, and one of those ways is decreasing stomach bloat. When you have a soft core, your midsection is easily able to hold in gas, whereas when you have tight ab muscles, it pushes the gas out. Makes sense right? Make sure you always do core exercises whenever you work out to keep your midsection strong. Here’s a video on a great ab circuit. If bloating is a big, annoying issue for you make sure you try out these tips to eliminate the bloat! Your tummy is sure to feel healthier and happier! 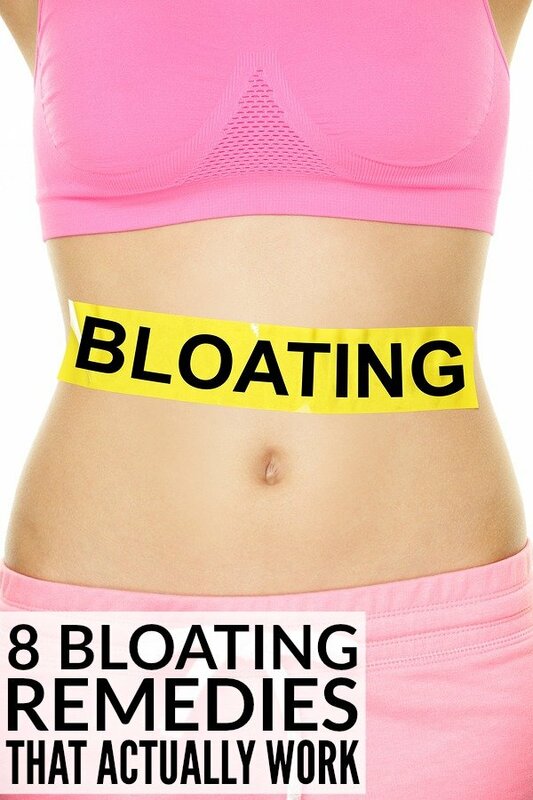 If you found these tips on how to get rid of bloating helpful, please share them on Pinterest! And if you’re looking for more health-related tips and tricks to keep you looking and feeling your best, please follow our Health and Fitness board where we share all kinds of great ideas!